We have been using this indispensable gadget since it first came onto the market, back in our college days. Yet, when we use it in front of guests, most look on with amazement—they’ve never seen a Champagne recorker before. So today’s tip is: Get one for anyone who enjoys a bottle of bubbly. They’re less than $10 in chrome, and we received a plastic version freebie from Yellow Tail that works just as well. And for the price, it’s painless to include one when you give a gift of Champagne. Or give them as wedding or anniversary party favors. 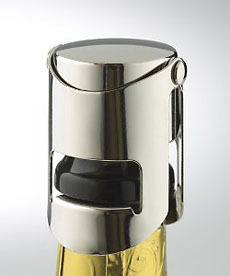 A Champagne recorker (also called a resealer) creates a tight seal at the mouth of the bottle, so the bubbles stay in. A rubber “cork” under the chrome cap fits the mouth of the bottle, and two “wings” clamp down to create the seal. A champagne recorker keeps it sparkling. This one is available from the Wine Enthusiast. Photo courtesy The Wine Enthusiast. To keep the fizz in the bottle in-between pourings. If we want just a glass or two but not the whole bottle. If we need just a cup or so for a recipe. If we have “leftovers” at the end of the evening. You can buy a Champagne recorker wherever kitchen gadgets are sold; online; and depending on your state of residence, in the store where you purchase the bubbly. According to Wikipedia, the Champenois (residents of the Champagne region) and other French who bought the wine drank it as a still wine (it’s made from Chardonnay and Pinot Noir grapes). Bubbles were considered a defect. They are the result of a secondary a fermentation process which takes place in the bottle, as yeast devour the grape sugar and create carbon dioxide. But the British—major customers for the wines of France—developed a taste for the unique bubbly wine, and the sparkling version of Champagne continued to grow in popularity, especially among the wealthy and royal (as opposed to the locals). More Champenois wine makers attempted to make their wines sparkle deliberately, but didn’t know enough about how to control the process or how to make wine bottles strong enough to withstand the pressure. In the 19th century these obstacles were overcome. Advances by the house of Veuve Clicquot in the development of the méthode champenoise made production of sparkling wine profitable on a large scale, and the modern Champagne wine industry was born. The house of Bollinger was established in 1829, Krug was in 1843 and Pommery in 1858. Do you know the different types of Champagne?